THE first photos inside Shane Warne’s luxurious Brighton mansion have emerged. As Warne prepares to bowl over buyers with a full-blown marketing campaign, images from inside his home have been revealed. The four-bedroom Italianate mansion is fit for a king, but apparently not quite for the spin king, who is believed to be heading for a luxury manor house in the English countryside. It’s also an entertainer’s paradise, with an aquarium, theatre, state-of-the-art Gaggenau appliance kitchen, a pool emblazoned with Warne’s playing number “23″ and a waterslide. There also is a monster entertainment space at the rear that extends into the sprawling backyard. Then there is the tennis court above the 10-car underground garage. Yet-to-be-released marketing material for the house reveals it was built about 1885 and named “Kilkerran”. It also reveals a bedroom that runs the “full depth of the first-floor”, comes with a “spa-quality ensuite” and a large dressing room – plus its own “private skygarden terrace with outdoor fireplace”. The palatial property is chasing buyers with a $15 million budget – and so is the new owner of Warne’s former home, another Brighton mansion about 400m from his current abode. Brighton real estate agency J.P. Dixon is selling both houses and Jonathan Dixon said they represented two of Melbourne’s most illustrious properties. “With notable Victorian detail, including multiple marble fireplaces and lavish leadlights . . . this significant home is a masterpiece of modern family living, with a unique heritage as one of Brighton’s finest historical homes,” Mr Dixon said of Warne’s home. THEY say a picture tells a thousand words and experts insist this is particularly true when it comes to buying and selling property. They also said it was important to start planning weeks before the photo shoot to make sure the property is at its best. Real Estate Institute of Victoria spokesman Robert Larocca said good photos were critical. “Location may be the most important factor for buyers when determining price, but it is the photos that help entice them to the open house,” he said. “Buyers won’t buy the home on the basis of the photos, and nor should they as you need to see the home itself, but a poor set of photos will ensure it’s the last on the list when they are hunting for the right home. The survey by photography company Top Snap found 89 per cent of agents said good photos attract more buyers. Almost 80 per cent said they increase inquiries and 68 per cent said they increased clicks to online listings. And half said they helped secure a higher price for the property. Top Snap general manager Helen Clarke said sellers should be comfortable with the person taking the photographs. “You want someone who will respect the fact that in many cases you’re putting your most valuable asset on the market and this represents not only a financial but an emotional transaction,” she said. Property Snaps director Vince DeStefano said many buyers are initially drawn to a property because of the photos. Mr DeStefano uses tools such as elevated poles and helicopters. His company is becoming Civil Aviation Safety Authority accredited to use a remote-controlled quad copter to take aerial photos. ICON Property director Robert Mitchelson treats property photography as a major production. He is a former TV and film extra, with a handful of commercials under his belt. He has appeared in about 85 productions – including alongside Anthony LaPaglia in The Bank – and said property photography was like making films, in that they are all about emotion. He said this was why his listings are only photographed at dawn or dusk. “We sell on emotion and if you can get that emotional connection on a property the price becomes secondary,” Mr Mitchelson said. Mr Mitchelson starts planning photography a week in advance, picking two nice days in a row based on the seven-day weather forecast. He attends each photography session as well, to ensure the photos don’t make the property look too small – or too big. “People will see it isn’t the same as in the photos,” he said. * Take the family out while photos are taken. WET weather on an auction day could save home buyers tens of thousands of dollars, new research has found. A study conducted by buyers advocate firm Secret Agent found home buyers saved an average $46,500 at auction on days when the heavens opened last year. With winter officially here and this weekend hosting a near record number of auctions for this time of year, there might be a few prospective buyers considering a rain dance. The Secret Agent study reviewed auctions from June to August in 2012 and contrasted the average result on a Saturday afternoon with less than 4mm of rain against those with more than 4mm. On the dry days the average sale at auction was $1,003,300. But add water and the price fell to $956,800. It works out to about a five per cent reduction in prices. “The weather conditions can play a part in the crucial point where someone is working out what they are willing to spend,” Mr Osborne said. But Mr Osborne noted that despite the potential for some loss to the maximum price tag on a rainy day, selling a house in winter could be an advantage. “There’s less auctions to choose from, which is good for competition,” he said. But despite showers being predicted today, home sellers need not fear – according to Real Estate Institute of Victoria spokesman Robert Larocca. “A sunny auction might be a more enjoyable one, but it doesn’t mean you are getting a better result,” Mr Larocca said. Despite predictions of showers this weekend Mr Larocca argued that the research hadn’t ascertained where the rain had fallen and that a bit of weather wasn’t going to stop a buyer who really wants a property from heading out to one of the 790 or so properties listed for auction this weekend. “It’s the second largest auction weekend after the Queen’s Birthday weekend in our market’s history,” Mr Larocca said. A SUPER-THIN tower using a revolutionary design has been proposed for a prime CBD site. A member of the Grollo family is behind the push for a 54-storey office and apartment building at 464 Collins St. Dubbed by some as the pencil-thin tower, it would feature one continuous structure of reinforced concrete and look like cutting edge buildings in cities such as New York and Hong Kong. Lorenz Grollo, head of the Equiset-Grollo group and son of construction legend Rino Grollo, said it would be extremely innovative for Australia and its use of concrete was a nod to his family’s business heritage. “It’s slender but it will make an impact. It’s done in such a sculptural way that is ultimately unique,” he said. “It’s not just a glass box, it’s a stylish piece of architecture,” he said. Designed by architects Bates Smart, the tower will house about 150 high-end apartments and 13 levels of premium office space. The facade of an existing Edwardian-era building will be incorporated. Planning Minister Matthew Guy confirmed a permit application was before his department and he would make a decision after input from his staff and city council officers. “It’s a very interesting design and it’s looking at innovative ways to optimise space,” he said. Mr Guy has approved several highrise towers in the CBD, including plans for the southern hemisphere’s tallest building at 108 storeys at Southbank. 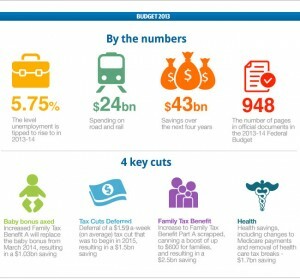 HERE are the changes to the Federal Budget in 2013, which could affect you. 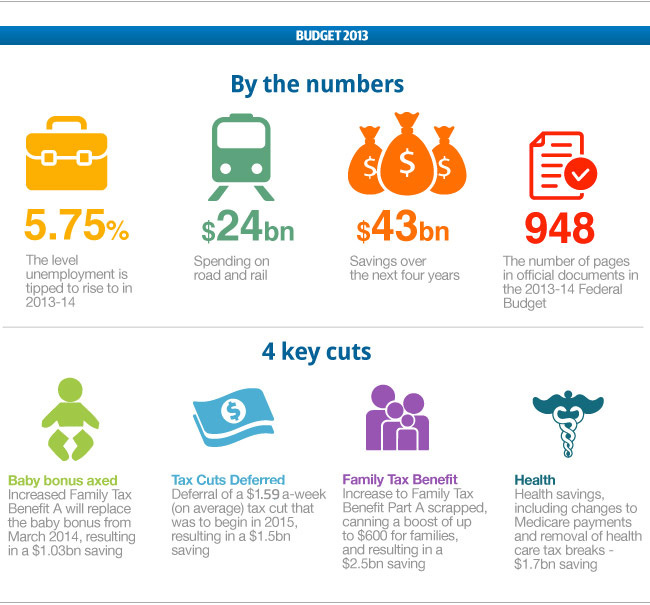 Take a look at Treasurer Wayne Swan’s announcements. ALMOST $200 billion of red ink spilled across the nation’s balance sheet looks to be Treasurer Wayne Swan’s legacy, as forecasters predict budget deficits “as far as the eye can see”. In five previous budgets, the Treasurer has racked up deficits of $173 billion and analysts tip the promised $1.5 billion surplus in last year’s budget papers will be replaced a deficit of between $10.9 billion to $22 billion. The size of a deficit will come under heavy scrutiny when Mr Swan stands up tonight at 7.30pm, as Treasury forecasts have been exposed as being based on too-optimistic outlooks. REDUCE the stress – and get the right price – when selling your biggest asset. Selling your home can be difficult and the costs of making a mistake are high. After years of experience in the industry selling and buying homes, here is my guide to being a smart seller. When working out who you might want to interview, choose agents who have a track record in your area and are known for selling similar homes. Check your local newspaper’s real estate section and see which agents have the most listings online. Check their profiles on Facebook and Twitter. Once you have three or four on your list, try to attend their open for inspections to see them in action. Ask their opinion about your home and its value, what sales method they would use, their knowledge of the market and area and – my favourite question – what they think is wrong with your home. Then ask how they would overcome this when selling the property. What your home is worth may not be what you want to sell for. Properties that sell for more than their market value are rare. Remember valuation is an art, not a science. Look at homes for sale near you — are they worth more or less than yours? Are they nicer or uglier than yours? Be honest. It is a tricky process but do get a rough idea before the agents come in. And when a figure is suggested, ask why and how it was calculated. Get your own sense or what your property is worth; look in the paper and search online for homes like yours in your area as a start. If you are really confused, get a valuation done. It costs just a few hundred dollars but can buy you peace of mind and give you an independent benchmark. You can’t sell a secret. Every buyer possible needs to know that your home is on the market and you need to reach the broadest number of possible buyers. Choose the print and online options most buyers are attracted to and that have proven track records. RP Data research shows the combination of print advertising with online is the most powerful way to sell your home. Get involved and check every picture and line of text. Demand creativity, not essays. There should be good English with no typos; you and the agent need to proof read the content. Make sure the number of bedrooms and bathrooms is correct and that the images show your home at its best. Except for real boom times, which are not that often, it is sellers who stand in the way of a sale, not the property. If you are not adequately motivated, you won’t put effort into the presentation, will skimp on the marketing and your price expectations will lead to either no sale or a long time on the market. Motivated sellers get the job done. They look at what is going on around them. Ask yourself if there are any negative personal or financial repercussions if you don’t sell soon? Will you accept that you may not get the sale price you hoped for? Is waiting not really an option? If you are realistic about these questions, congratulations, you are a motivated vendor. A motivated vendor will be realistic about these questions. Which sale method is best for you? Ensure you understand the different sale methods and the rules and protocols of each. Write a list of the pros and cons of each method for selling your home. A quick look online or in the newspaper will tell you how most homes in your area are sold. If you follow the successful crowd, you will give buyers the sale method most common for their market. Auctions are a good option if most homes in your area are sold in this manner, you need a sale within a defined period or your home is unique. Many people believe that if a home put to auction does not sell on the day, it is a disaster. But research shows most homes that fail to sell on the day do sell quickly afterwards. The benefit of the auction process is that it gives you an intense period of market feedback so you can adjust your price expectations. Get your pricing wrong with a private treaty process and your home can languish for months or even years. No matter how great your home is, how creative and successful your marketing has been or even how strong the market is, negotiation is key. Even if your negotiator is your agent, you, too, are involved. You need to be in a position of strength. One of the tricks is to put yourself in a buyer’s mindset. Learn what the buyer’s motivation is to buy your home. Knowledge is power and you need to keep emotions out of it. A buyer often will try a low offer, and that upsets vendors. But see it as part of the game – and in many cases you would do the same. Don’t take things personally and remember that successful negotiating is one of the key reasons you are employing an agent, so let them handle it. If you trust them – you should because you vetted them thoroughly – follow their advice. ANZ has slashed rates by more than the Reserve Bank to the lowest level among the majors. In a bid to dethrone National Australia Bank as the cheapest in the market, ANZ has announced it will cut its mortgage rate by 0.27 per cent. Both NAB and ANZ are offering a standard variable rate on home loans of 6.13 per cent. ANZ Australian chief executive Philip Chronican said this is good news for customers with the reduction in funding pressures clearing the way for the bigger than expected cut. “While competition for deposits remains strong, our overall funding cost position has allowed us to reduce variable mortgages by 0.27 per cent,” he said. The ANZ decision is effective from next Friday May 17. All of the Big Four Banks have passed this week’s RBA cut on in full. Until the ANZ announcement NAB’s mortgage rate was the lowest offering among the majors in the market for 46 consecutive months. The rising unemployment rate and slow home loan growth has forced the Reserve Bank to cut the official cash rate. At its board meeting earlier today, the RBA decided it was “prudent” to cut the official cash rate 25 basis points, taking it to the historic low of 2.75 per cent. RP Data’s national research director Tim Lawless said while the Reserve Bank was likely to be “reasonably comfortable” with the pace of the housing market recovery, there were no doubt a few things playing on the Board’s mind when making this month’s cash rate decision. “What may have been most concerning to the RBA though is the pace of dwelling construction and consumer appetite for newly constructed homes,” he said. “Dwelling approvals and commencements remains weak and although new home sales have improved, according to the Housing Industry of Australia, the number sold remains historically low. Real Estate Institute of NSW CEO Tim McKibbin said the reduction in interest rates was the correct decision given the current state of the economy. “We have been calling for another cut in interest rates for some time,” he said. “Through structured incentives, including interest rate reductions, we are seeing the green shoots of growth and we are delighted the RBA has acted to support the economy generally. “The 25 basis point cut today, combined with the decreases in 2012, will provide the necessary stimulus and confidence to build upon the modest gains in the property market seen towards the latter part of last year and into 2013. “It is vital the RBA continues to respond to the needs of our economy, in particular the property market,” Mr McKibbin said. The big news in property this morning is the Victorian Government’s overhual of the First Home Owner’s Grant as of July 1, 2013. For those looking to build, or purchase a newly built home, you’re in luck. The government has increased your grant from $7,000 to $10,000. For those looking to buy an established home, you’re out of luck. The government is scrapping your existing $7,000 grant, so you get nothing. The good news for both camps is the 10% further reduction of stamp duty that was scheduled to take place in January 2014 that has now been moved up to July 1, 2013. So first home buyers, no matter how old the property being purchased, will get a 40% discount on Stamp Duty for purchases up to $600,000. These new rules apply from the 1st of July 2013. If you want the grant as it is now, you have until the 30th of June to sign a contract. If you want the “new” grant, you need to sign the contract after July 1. Please note, the rules are based on the date you sign the contract, not the settlement date. Check out the article and video on the ABC Website here. The City of Casey is an outer Melbourne municipality including suburbs such as Berwick, Cranbourne, Endeavour Hills, and Narre Warren. The City of Casey is one of Melbourne’s major growth areas with its population increasing by 43 per cent between 2001 and 2011. This was much faster than metropolitan average of 18 per cent over the same period. With a population of 260,400 people in 2011, it is the largest municipality in Victoria. The median age in the Cit of Casey in 2011 was 33 years which was younger than the metropolitan median of 36 years. This younger demographic is evident in population growth between 2006 and 2011 in which 43 per cent of the growth were under 34 years of age. More recently between 2010 and 2011, this age group comprised an even higher share (54 per cent) of growth. The City of Casey has a low level of home ownership with 25 per cent of households owning a home compared to the metropolitan average of 33 per cent. As expected of a growth area, the majority (54 per cent) of households in the City of Case have a mortgage which is much higher than the metropolitan average of 38 per cent. With nearly half (46 per cent) of the households comprising of couples with children, the City of Casey also has a larger household size of 3 compared to the metropolitan average of 2.6 persons. As it typical of an outer growth area, the City of Casey is also low density with nearly all (91 per cent) of homes comprising of separate houses compared to the metropolitan average of 73 per cent. The City of Casey has a slightly higher weekly household income than the metropolitan average with a median of $1,893 compared to $1,333. However the median monthly mortgage repayment was lower than the metropolitan average at $1,733 compared to $1,810. This is reflective of the more affordable house prices in the City of Casey which proved attractive to first home buyers and young families. The City of Casey appears more multicultural than the metropolitan average with 36 per cent of residents being born overseas compared to the metropolitan average of 33 per cent. Aside from Australia, the top three countries of birth were India (4 per cent), England (4 per cent), and Sri Lanka (3 per cent). The median house price in the City of Casey has increased from $288,000 in September 2007 to $370,000 in September 2012. This equates to capital growth of 28 per cent which is higher than the metropolitan average of 26 per cent. It remains below the Melbourne median house price of $530,000 in September 2012. The median unit price in the City of Casey increased from $220,000 in September 2007 to $266,000 in September 2012. This equates to growth of 21 per cent which was in line with the metropolitan average. Between 2007 and 2011, there were over 5,150 house and unit sales per annum in the City of Casey. However transaction levels over the past two years in 2010 and 2011 have been below this average. It is estimated that there will be around 2,700 sales in the City of Casey in 2012, slightly lower than transactions in 2011 of 2,800 sales. Around 2 per cent of sales in the City of Casey between 2007 and 2011 were auction sales. It is estimated that auctions in 2012 will continue to comprise around 2 per cent. The total clearance rate for the year to mid-November 2012 in the City of Casey is 42 per cent, lower than its five year average clearance rate of 69 per cent. Four out of the top five auction suburbs in the City of Casey had a lower clearance rate in 2012 year to date than in the previous year. Endevaour Hills proved an exception with an improvement in its clearance rate from 50 per cent to 62 per cent over this period. It also recorded the highest clearance rate in the City of Casey. Between September 2007 and September 2012, there were around 2,500 new building approvals per annum in the City of Casey. Building activity over the past 12 months ending September 2012 have been more subdued with around 2,300 building approvals, six per cent below its five year average. In June quarter 2012, the unemployment rate in the City of Casey was 5.4 per cent which was in line with the metropolitan average. This marks the first increase in the unemployment rate in almost three years. The City of Casey has a high number of blue collar and white collar workers with the top five occupations shown in the following table. THE Reserve Bank says funding costs for retail banks have clearly fallen, heaping fresh pressure on the nation’s major lenders to cut rates independently. Major business lobby groups have seized on the revelation, calling for the banks to cut their borrowing rates out of step with the RBA. MORTGAGE holders have enjoyed their last interest rate cut and should brace for rising rates in the coming year, according to News Limited’s shadow Reserve Bank board. But a majority of our nine-member expert panel believe the Reserve is done cutting rates. At 5.65 per cent, the discounted mortgage rate is at its lowest in half a century, excluding the Global Financial Crisis, as the Reserve Bank seeks to engineer a recovery in non-mining parts of the economy. IT’S getting harder to make properties stand out when it comes time to sell. In a heavily digitised world, a click of a button brings up dozens of properties with the same attributes and amenities. But rather than rely on luck, a handful of enterprising vendors and agents are finding new ways to stand out from the crowd. Realestate has explored some of the more unusual and often effective methods that may end up changing the face of selling property. Thousands of Melbourne properties go under the hammer each month, so just getting buyers to your auction can be a battle, and it’s often difficult for the auctioneer to coax hands out of pockets. Coffee vans trawl auction sites to warm up bidders in the winter months and ice cream trucks are among the summer sweeteners luring bidders. But with real estate running second to the AFL as a weekend Melbourne pastime, some agents have turned to the sport to help them kick goals. Richmond midfielder Brett Deledio managed only the one disposal at an Ormond auction earlier this year, but after signing the football before handing it off to the first bidder to break the $800,000 mark, it was an effective touch, according to Buxton auctioneer Craig Williamson. “It got the numbers up – we had called $840,000 on it ahead of the auction, but it went for $915,000 . . . and a football,” he said. Ray White auctioneer Andris Crawford, faced with the challenge of an AFL Grand Final day auction last year, held a raffle immediately afterwards to give away a ticket to the game – bringing in a hefty crowd for the event. The next best thing to bidders at an auction, is a crowd, says Mr Williamson. “There’s certainly a correlation between a big crowd and a positive atmosphere and the premium prices being paid for properties,” he said. Mr Williamson has used local musicians, face-painting, sausage sizzles and balloons to bring out the local community for auctions. “A lot of local residents have a general interest in real estate anyway – they like to see what’s happening in their suburb out of interest – (but) this was like a carnival. From down the street, you could hear the live music and (people) were drawn to it,” he said. A Warwick St, Bentleigh East, auction with the treatment sold for $627,000 – $37,000 over its reserve price – while a townhouse in Smith St, Hampton, went for $1.59 million, far above the $1.4 million expected. Both attracted about 200 people. The local community and lifestyle are a major factor in residential sales. But Hall and Hall director John Richards has furthered the concept, using video interviews with local businesses to let local personality make it seem more like home. “(It shows) why you would want to live in the suburb, and then you are on your way to selling them a property in the area or nearby,” he said. In theory, the process increases the buyer base for a suburb and buyers get a feel for the locals. Good photography or a video of a property can help it stick in the mind of potential buyers. Even baking some cookies or making some coffee just before an inspection can help make your home stand out. But a recently listed Italianate manse on Phillip Island is offering prospective buyers a literal taste of the property, with each receiving a hamper of home-grown cucumbers, lavender, lettuce, rhubarb and zucchini. There’s even a pot of home-made raspberry jam and bottle of olive oil made on site at Villa Fortuna in Cowes. The four-bedroom villa is tempting buyers in the $4.5 million range and needed an edge, says Mr Richards. “The idea is that it keeps the memory alive and they go home and they are cooking and they use the olive oil and they see Villa Fortuna on it,” he said. He believes similar approaches will soon be more common for properties with price tags north of $1 million. Andrew Thomson, whose Benalla home has been on the market for more than a year, has tried a different tactic and recently offered to fly Queensland flood victims to it. “I’m hoping to fly a successful bidder down – last time there were bad floods in Queensland, my real estate agent said he was inundated with people looking to move down to Victoria,” Mr Thomson said. He’s also targeting city-slickers intimidated by the extensive lawn, offering to include a full year of lawn-mowing services for the 93 Grant Drive property. HOMEOWNERS can breathe easy for another month after the Reserve Bank left interest rates unchanged at 3 per cent at its monthly board meeting. Most economists had expected the central bank to keep the cash rate steady. The RBA cut the cash rate four times between May and December in 2012, reducing the rate by 1.25 percentage points. RBA governor Glenn Stevens said with economic growth expected to be a little below trend over the coming year, it was prudent not to change the cash rate. However the central bank has room to cut if economic conditions deteriorate. “The inflation outlook, as assessed at present, would afford scope to ease policy further, should that be necessary to support demand,” he said. Mr Stevens said the risks to the global economy appeared to have eased in recent months while commodity prices, a key driver of the Australian economy, remained high by historical standards. The Australian dollar fell by 0.1 of a US cent after the RBA left the cash rate unchanged with the currency at 104.50 US cents at 2.32pm AEDT, down from 104.60 US cents shortly before the bank’s decision was announced. AMP Capital chief economist Shane Oliver it appeared the RBA was in “wait and see mode” on interest rates. The RBA faced the dilemma that while lower interest rates were having some effect on the economy, the Australian dollar remained high and credit growth was weak. “There’s no indication that they’re about to move next month,” Mr Oliver said. UBS economist George Tharenou said that although a further interest rate cut was possible, it was looking increasingly likely the RBA would keep the cash rate on hold for the rest of 2013. Mr Tharenou said said a recent improvement in house prices was a sign that last year’s interest rate cuts were having the desired effect on the economy. He said the RBA appeared more confident that the non-mining sectors of the economy would pick up in 2013 as the mining investment boom peaked. “Our view is that, baring some unforeseen risk event, the RBA is going to remain on hold from here,” he said. Hill Real Estate Berwick wins again. We have done it again 3 years in a row, Rotary Club of Berwick charity golf day Real Estate Industry Award, seen here at the presentation by the City of Casey Mayor Amanda Stapledon, Thanks to my TEAM seen in this photo from left to right Craig Bilski , me, Mayor Amanda Stapledon, David Rowlands, and Peter Stilburn. A NATIONAL housing recovery may be facing a new hurdle, with first-home buyer mortgage commitments sliding to record lows in some states, according to the latest figures from the Australian Bureau of Statistics. Between December 2012 and January 2013, first-home buyer commitments slipped by 11 per cent, sparking concerns that the Australian housing market will continue to face strong headwinds if the trend is not reversed. The number of first-home buyers as a percentage of total owner-occupied housing commitments remained steady at 14.9 per cent in January, but this has decreased steadily since September, when it sat at 19.4 per cent. New South Wales and Queensland experienced record lows for first-home buyer commitments in January, with 7 per cent and 10 per cent respectively. Levels have plunged in these states by more than 10 per cent since their governments replaced first-home owner grants with incentives to buy new properties. These statistics are driving the national average downwards, with Western Australia, South Australia and Victoria all trending up over the same period. “The bulk of first-home buyers are still buying established dwellings, because they are more affordable,” said Angie Zigomanis, senior manager residential, BIS Shrapnel. The result of the rush to get in before October means that many who would have been in the market now, purchased last year instead. “There are a fixed number of first home buyers out there, people that haven’t bought yet and are considering it” said Mr Zigomanis. WHEN I was a kid I would throw myself off the roof at home and onto the lawn a few metres below, sometimes flapping my arms wildly for some added stupidity. Fortunately, taking this plunge never produced any broken bones, thanks to a spongy lawn. However, failing to take an investment plunge is a sure-fire way to produce broken dreams. Turmoil in shares, superannuation and real estate in the past few years has made it easy to become paralysed about making investment decisions. It’s all too hard, I don’t want to lose my money, I’ll wait until things improve these are common reasons for people doing nothing about becoming an investor. The problem is that when we wait, we miss opportunities. Shares have surged 18 per cent since November and many people are only now starting to notice them again, while property experts say the real estate market has bottomed and will be boosted by low interest rates. There will always be doomsayers predicting the end of the financial world, just like it is certain that shares, property and other assets will fall again at some time in the future and lose investors money. That is why it is important to use a measured approach to investing and avoid a gung-ho mentality that sees you blindly follow the herd. Take small steps, do loads or research, speak with experts who have succeeded in the field, and for shares and funds buy small parcels at a time that you can build upon as you gain experience and knowledge. Proceed with caution, but always proceed. Paralysis is for pansies. Take the plunge, but make sure there’s some spongy lawn to protect you. Flapping your arms is optional. Anthony Keane is editor of Your Money. BEST to spruce up your kitchen when selling, it’s the room most important to potential buyers according to a new survey. The most important room for women when inspecting a property is the kitchen, while men prioritise the living areas, according to a survey by mortgage broker Loan Market. More interestingly, both men and women agreed that bedrooms are the least signification rooms for them when deciding on whether a home makes the grade. A poll which asked buyers and owners ‘When inspecting a property, which room is the most important to you?’ found that 49 per cent of the 612 respondents said the kitchen, followed by 38 per cent for the living area. However, female and male respondents disagreed about which room was the deal clincher; 59 per cent of women chose the kitchen as their first choice while only 37 per cent of men pointed to the kitchen, making it the second most popular option for blokes. Women found the living area far less important than men with only 24 per cent naming it the key room for an inspection compared to 56 per cent of men. Loan Market corporate spokesperson Paul Smith said these results indicated that buyers don’t assess a property on its existing fixtures and features but rather its scope for improvement. “Often when a buyer shows interest in a property it’s because of the potential they see in certain rooms of the house or unit. Today’s buyers have become astute at assessing how much effort and additional money may be required to get the property to that point,” he said.